Stabilizer tube. 93V 10...30mA. The stability with this construction results from the glow effect growing along the spiral at higher current. At small current, only a small part is lighting. At higher current, so to say, there are more "small" parts in parallel, thus reducing the dynamic resistance at higher current. This is the secret of this tube. At higher current, it can be seen the "glow" can not grow further along the spiral, it is already at the end. From that moment on, a current increase will greatly increase the brightness, but voltage is less good stabilized. I measured this takes place above 30mA. An amazing product this is. The interesting thing, is you can see the current it draws by the length of the spiral. Moreover, when the lighting part is below 100%, this means the stabilizer is not overloaded and working well. So in a way, it is also an indicator. Very nice coke bottle glass. Only used very short, by a customer of mine who bought many NOS spare tubes over the years. Test 100% new, also optically no sign of use. Clean like new, but boxes gone. Coke bottle glass. In original orange 1975 SVETLANA boxes with winged =C = logo, and original box. pict1 - pict2 . Original Box, Cylinder glass. Please inquire. 5Y3GT. 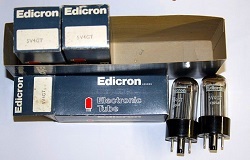 Used in Hickok tube testers. 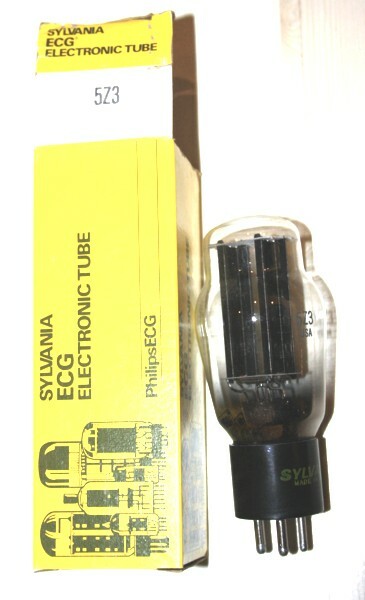 On boxes is written: Sylvania-Philips-ECG. Inside are vintage Sylvania tubes, with green print. BE CAREFUL 5U4G NOS is closed to SOLD OUT where ever you go. People have been gazing at low 5U4G prices for 25 years, and thought it was normal. Suddenly now, 5U4G prices are 10x higher. 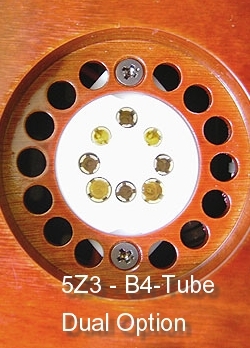 5Z3 is the same tube, just with another socket, so chances they will go the same way are very high. All you need to do, is wait until it is too late, and you will see I was right. 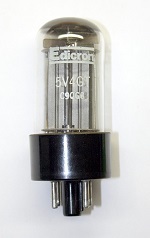 Use of 5Z3 and B4-Based tube to replace 5U4G. The B4 brother of 5U4G is RGN2405. Many of the B4 (British-4) are very similar to 5U4G and can replace them in circuits up to 200mA output current. 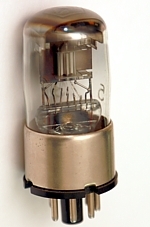 Such tubes are RNGN2004 and PV200/600 (see below). 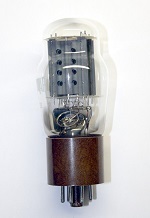 This Yamamoto socket has a dual footprint, so eight holes, and fits 5Z3 and a B4 tube at the same time. 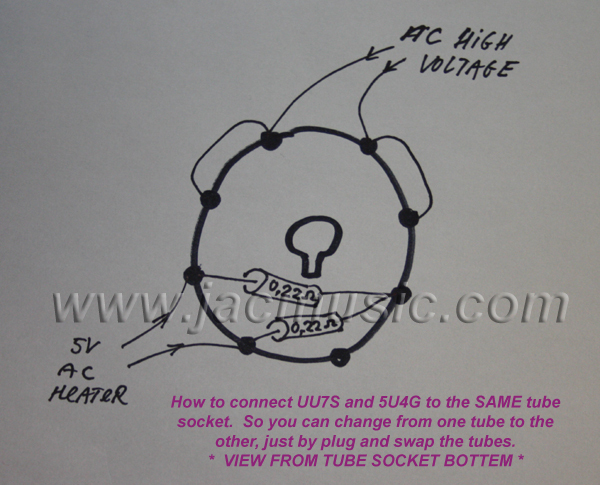 Whereas 5Z3 is electrically equivalent to 5U4G, many B4 tubes are very similar, but have 4Volts heater. In order to simply connect those tubes, first thing you do, is wire the 5Z3 rectifier the normal way, to the four pins of the 5Z3. Then, of the B4 socket, you connect the anodes in parallel to the 5Z3. The heaters of the B4, you connect to the heaters of the 5Z3, but you do so with two small resistors. The value of those depend on the B4 tube you take. This reduces the heater voltage to 4 Volt. Then, all you do is plug in the tube you want, and the 4V/5V switching is done automatically by the resistors. Where If = specified heater current of the B4 tube. 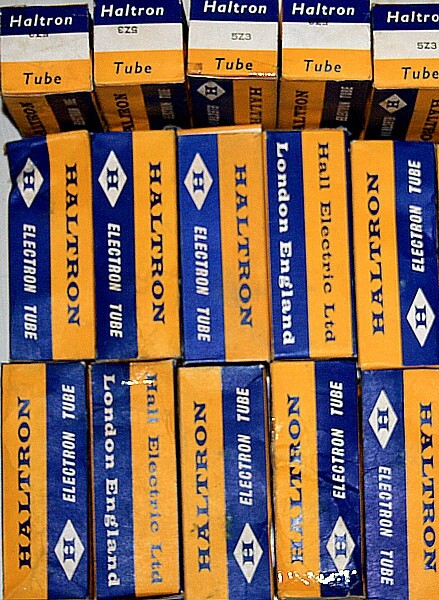 Haltron, London UK. 5Z3 is electrically equivalent to 5U4G, but has a 4Pin socket like 300B. Why use expensive 5U4G, while you can get this nice coke bottled European tube? ! 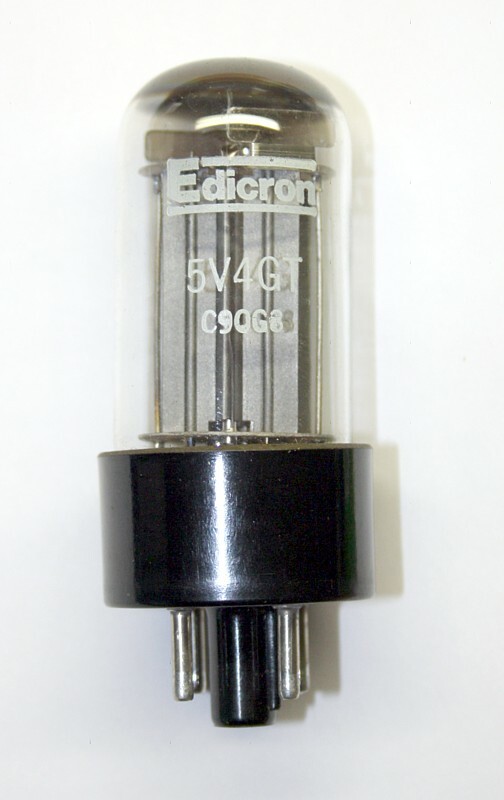 Equivalent to D63 and 6H6GT Western Tubes. Lovely double rectifier, for instance to generate negative grid voltage. We sell those at very low cost. Vintage construction inside. Alone the base is worth it, to re-base other tubes with a metal base. They go for 5 Euro per five pieces, so 1 Euro each. (In Europe 19% tax is added). The nice metal base alone is worth it, to re-base other tubes. 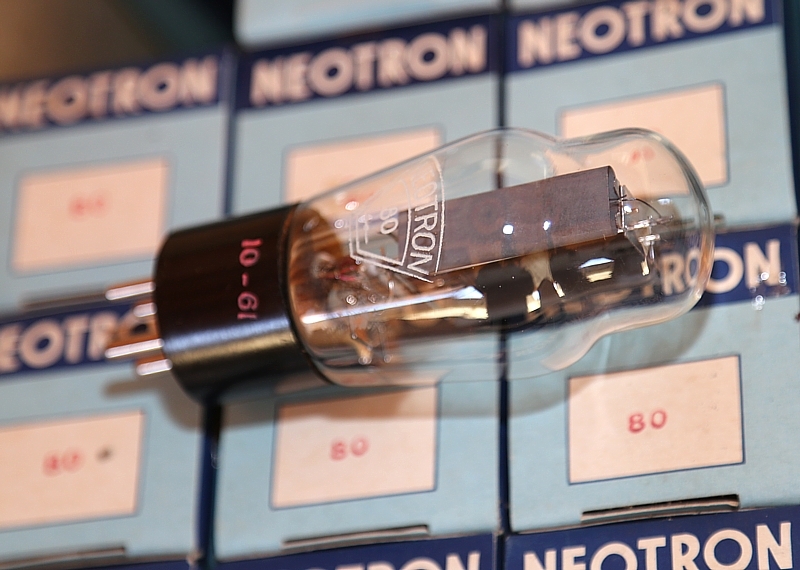 Looking for an ideal rectifier for small amplifiers? Well this 6X5 is the one! 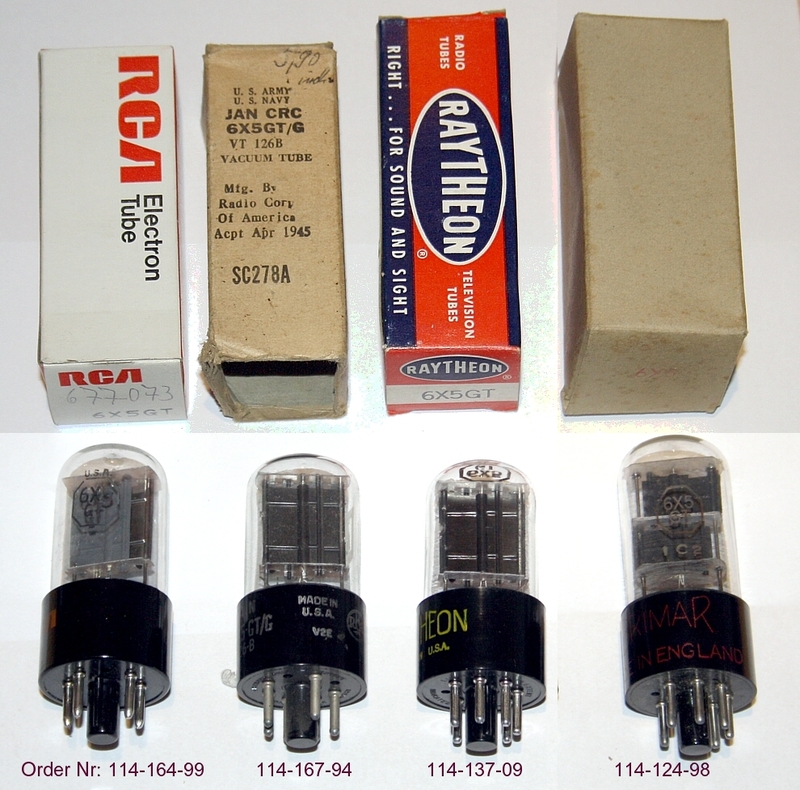 You have the nice octal based, non-miniature tubes, and 6X5 is from a period where quality was at it's best. 6X5 is not a fast starter, so it saves transformer and capacitors. Used by Audio Note Kondo and many others. For it's small size it can take quite a large capacitor. So 40uF at only 40mA will give very low ripple. Hint: If you want to use an 80uF Capacitor, you can just put two 6X5 in parallel. Here are some examples of what it can do, just taken from this chart here, so you can choose your own operating points. If the transformer wire resistance is too low, you can add an external resistor. So stay above a total of 2x 150Ohms, this is the official RCA spec. Beautiful French Made tubes, in original 50pcs factory carton. Date code 1961. 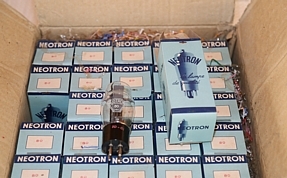 Inside boxes are like new, and the tubes also. You do not find this every day! Very nice box. Chrome(silver) getter flash. Nice collectors item, and good working tube too. Good testing, very large shiny getter. . Beautiful appearance, with engraved base. This is a globe version of the 80 tube. 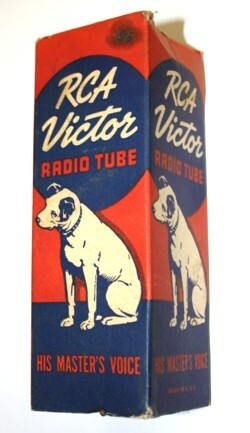 Made by RCA, branded Cunningham. A "No Mercury" Version of 83. This is a low voltage drop rectifier. Most of them in original box. 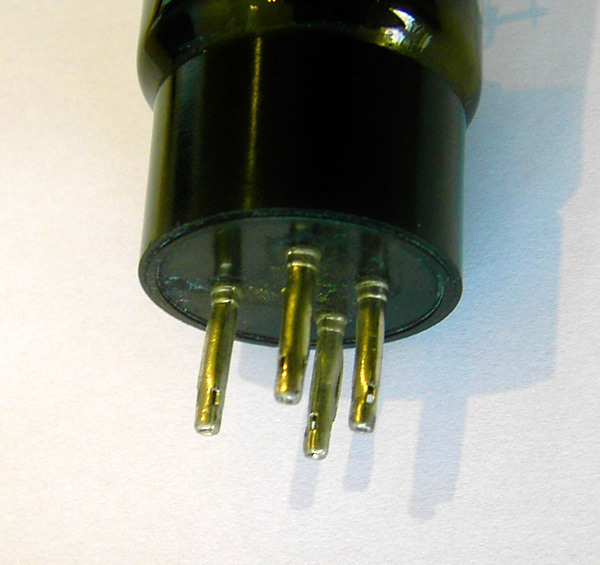 Mercury rectifier. Very rugged tubes. Specialty of this tube is must longer life, and it can be used at maximum current at no problem. This tube lights up with blue-white light, and has very nice blue glow effects all over. Mercury tubes: These have Mercury drops inside, which will evaporate when hot. For maximum use conditions it needs always a warm up of 5 Minutes, before plate voltage is applied. For low voltage, low current conditions you can switch it on, directly. 5V 5Ampere heater. Capable of 1 Ampere peak anode current. It has the European B4 socket, and a nice bakelite screw connection on the top, for the anode connection. So you need no plate cap, you can directly attach a cable to the tube. The tubes are full of little crumbs, but this is normal with older type Mercury tubes. They are NOS, so the Mercury is still in bound to the Mercury pill remains. 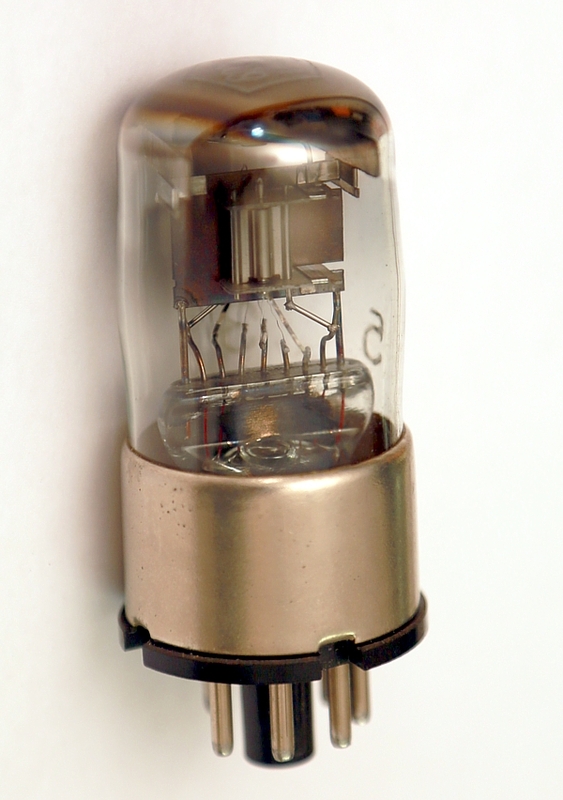 First time you heat the tubes, the Mercury will silver flash the glass, and then evaporate. 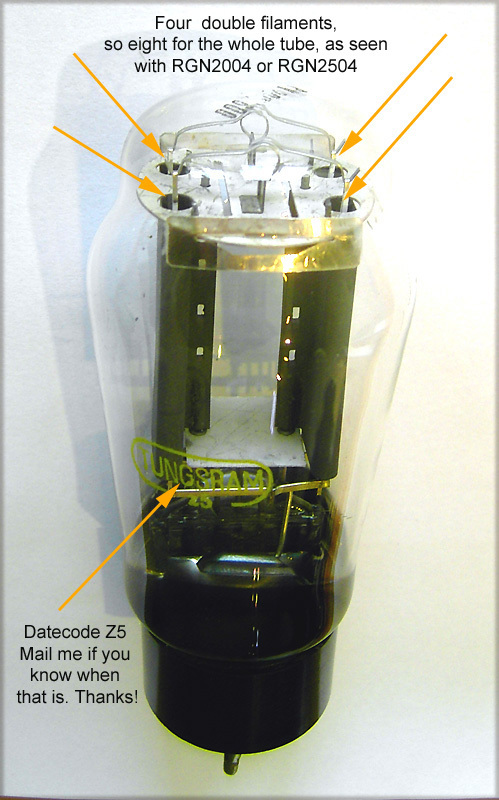 After some minutes, when the glass becomes clear again, the anode voltage may be switched on. 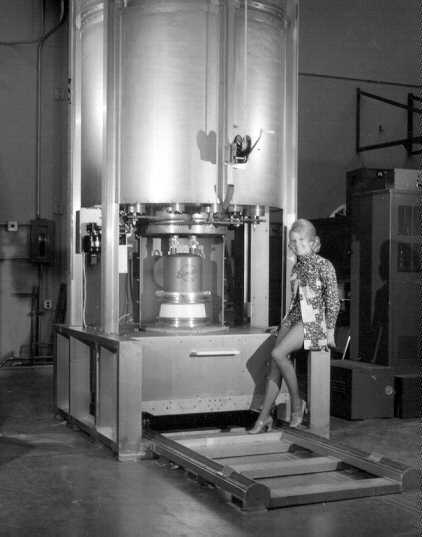 Then after some use cycles, particularly when you let the cool down in the normal, upside position, most of the (Mercury containing) particles and the Mercury drops, will collect on the tube bottom. These appear to have a Zirconium coated cathode shield, and Carbon coated anode. So they put quite some technology inside. Lifetime expectation can be 40.000 hours for such tubes. Undamaged, lovely colored Italian tax sticker from the second world war. If you are looking for NOS collectors items....here they are! 110 Euro for the pair. Never seen version of AZ1, box is in German text. Nice coke bottle. Clean box. Tests 105/110mA on Funke W19. Exceptionally strong test values! 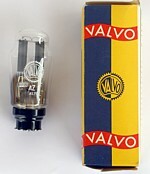 Mint quality tube + original package. Was opened only for picture and tests. Pict1 - Pict2. Click both pictures, for Test results with Funke Tester. Single tube. Original box, but one flap missing. Tube is like new. Globe, mesh tubes. Very strong testing tube, but on the glass top, where the logo is (was...), are deep scratches in the glass. Globe, mesh tubes. Very good quality. NOTE AZ4 is the same as AZ12, but another socket. AZ4 is a 200mA type rectifier, electrically close to RGN2504, also a 4Volt tube, and also with the wide plates of RGN2504, and also eight filaments. 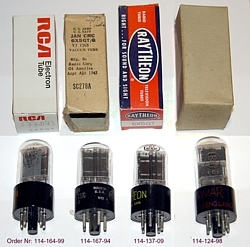 So AZ4 is almost the same tube as RGN2504. The difference is 50mA and another socket type for AZ4. Personally I like the socket of AZ4 more, because it works so nice when you plug and unplug the tube. We have bakelite sockets NOS for AZ4 on stock. AZ12 is a 200mA type rectifier, electrically close to RGN2504. It has double size plates, and eight filaments. NOTE AZ12 is the same as AZ4, but another socket. 1x Original box with AZ12 labeled on it, but box is a bit worn. Tube comes out like new. 1x Original box- Like new. Box was sealed, but opened for testing only. 1x Original box. Still sealed, same tube as above, same date code on box. Sealed tube can be opened before shipment, to test it if you want so. 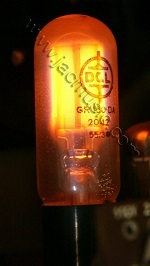 GR150DK is the same tube as the Funke tube GR150DA , except it is lower current, and it has a bayonet base. The base is the same a double filament 12Volt car lamp. 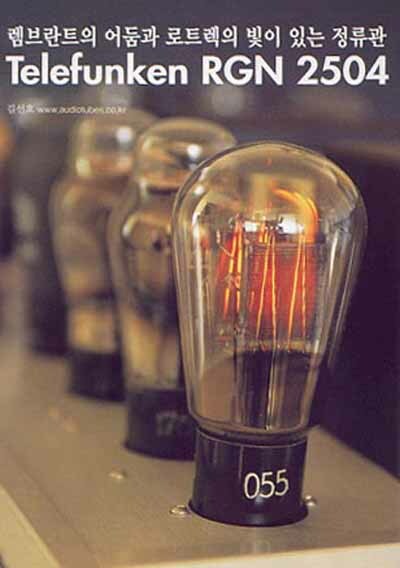 So for instance like a t 5+21Watt lamp. This socket for this tube should be really easy to get. 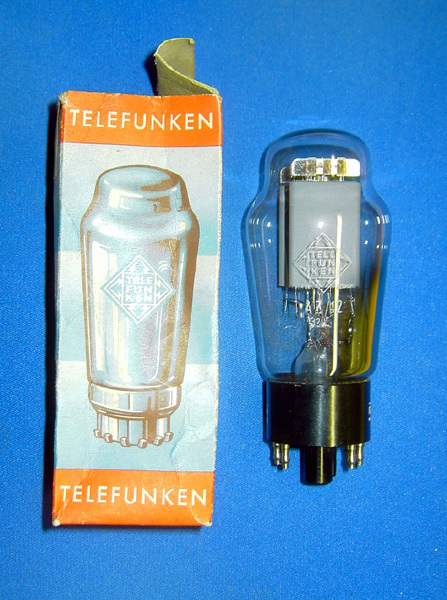 I would recommend to use the Funke W19 schematic, but change it for the lower current of this tube. So effectively with the big GR150DA as used in the FunkeW19 schematic, you can get 150, 200 or 250Volt at 0...100mA. With this little tube GR150-DK, 0....25mA should be possible. If the load is guaranteed, not to change within +/-12.5mA, you can as well stabilize 100mA with it. Possibilities are larger than you think, and occasional overload will do no damage. 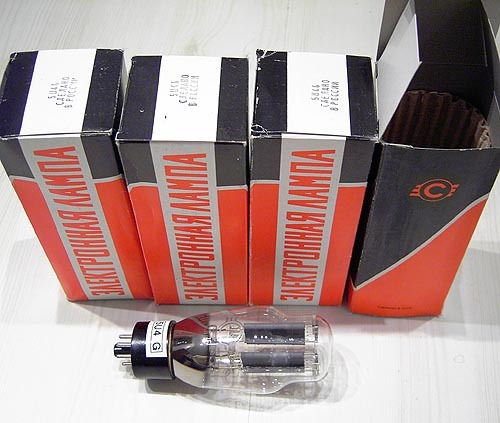 This tube is like the famous Funke tube tester stabilizer tube, only it is for 100V. DC Current minimum 5mA, max 60mA. Year of build: 1956. I tested it, and above 25mA it "nails" the voltage at 100V. Amazingly precise. 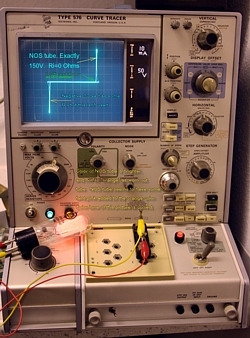 Click on meter image (This is a Metrix U61B) and you will see EXACTLY 100V, note the picture is made a little bit from the side, but you can see the parallax in the meter scale mirror. It is 100V exactly. Unlike what some fools say, there is NO replacement for GR150DA. Even Funke writes, you can use only selected version of GR150. (GR150DA). 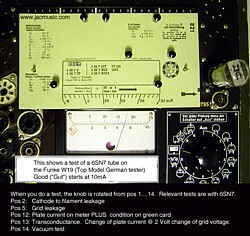 Of course you can put some 150V device in the tester, but load characteristic is different (read text further down here), and test cards are based on that particular load characteristic of the FUNKE SELECTED type, which is called GR150DA. The challenge is with testing most triodes, which react very strong to just a few Volts changes of the anode voltage. If you do not believe this, put a 2A3 tube at 148V at Grid 0V, and at 151V at Grid 0V. That will make quite some difference. The GR150-DA is a very special product. It can not replaced by anything else. 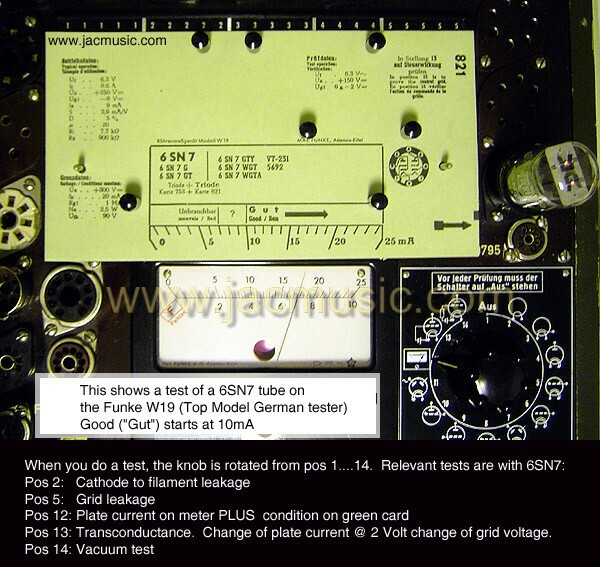 It has a dynamic impedance, which the Funke test cards are adapted to. It is specially made for Funke. 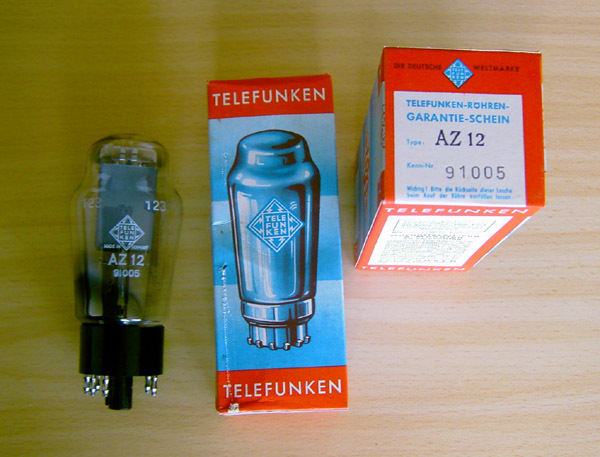 In the Funke Blue book, that is with the testers, it describes clearly in German: You can buy this tube only from Funke. We have a small lot here, in original double packs, by DGL, with pink printing on it: Made for Funke. THESE ARE WHAT YOU NEED. There are no other. The special voltage to current chart of the GR150-DA, plays a role in the "good begins at....." indication, on the test card. Even the FUNKE MANUAL says you may only use the "DA" Version and no other. The "DA" is a specially selected version for the Funke testers. These are original words by the Funke company, in their blue book. Though the tube itself is 150V, 5...60mA, it is possible to build a stabilized a power supply from 0...100mA, and 150V or more. The trick is, not everything will go through the tube. Some part goes into the load as well Check the circuit diagram of the Funke W19 tester, for an excellent application example to get a whole range of stabilized voltages, up to 250V, 0...100mA with only one 150V tube. This schematic demonstrates the forgotten art of using tube stabilizers, there is no better example. The light effect of the tube is magnificent. In daylight it looks very bright as well. This is a mesh wire tube. So you can look through. Please follow the link on the left, if you are interested in technical details. I have measured a normally working, seemingly "good" tube, and compared it to a NOS. The difference is very large. So it seems clearly older GR150DA tube become imprecise. I found they can have an impedance of 700 Ohms. vs. almost zero ohms for a new tubes. I don't want to explain here, how this can cause wrong results, but you can believe me it does. Mainly it will do so with low impedance triodes. Note: NOS tubes have a faint shade of pink added to the neon color. You can even see that on the pictures here. Older tubes burn in deep orange color same as any old neon lamp. So even when you think a GR150DA tube is "good", the accuracy becomes very questionable when a worn out GR150DA has 700 Ohm plate impedance, virtually adding up to the plate impedance of the tube your are testing. Better take a NOS tube, and keep the old as a spare. Or sell the old on Ebay, I have seen people pay 150 Euro there for a used tube. Boxes are cleaner than clean. Mint condition item. Amazingly nice glow picture, because of plate holes. Mint condition item. These are made in Russia, AEG Branded. 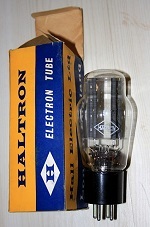 108 Volt, 5...30mA precision stabilizer tube. No filaments, but a cold Cathode, only two electrodes. Works just like 3Watt Zener Diode. Lights bright purple. 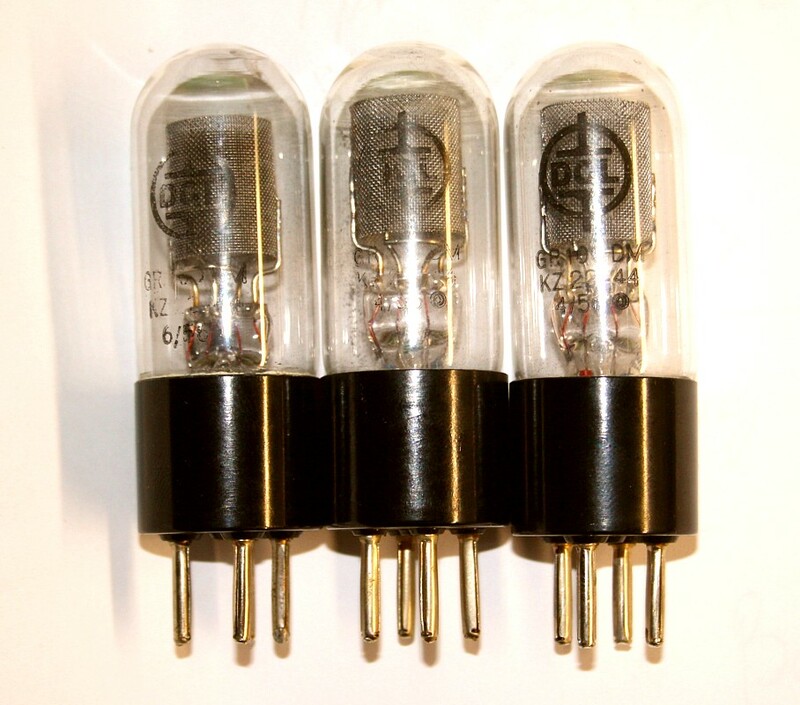 Put four of these in series and get a 0432Volt/12Watt stabilizer diode for your 300B amplifier! These were used as precision references in equipment. Actually they are more precise than solid state Zener diodes. 105 Volt, 4...40mA precision stabilizer tube. No filaments, but a cold Cathode, only two electrodes. Works just like 4Watt Zener Diode. Lights bright purple. 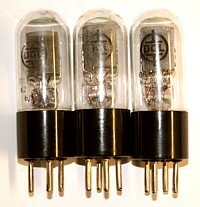 Put four of these in series and get a 420Volt/16Watt stabilizer diode for your 300B amplifier! These were used as precision references in equipment. Actually they are more precise than solid state Zener diodes. These have CILINDER Glass and these burn bright orange. Equivalent of RGN1054. (see table) Good replacement for Neuberger tube testers. Istvan from Hungary, wrote me, "Z5" means Dec 1959. 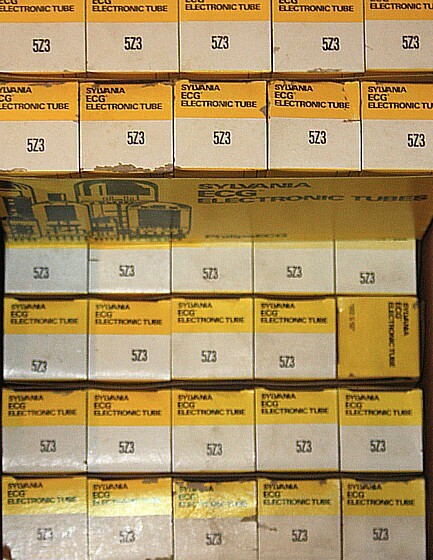 Gorgeous looking tubes, with nice yellow printing on it. They look much nicer than on the pictures. Bases are clean and very tight. Great tube, because it can do 600VDC at 200mA. Construct a bridge rectifier with four of those, (Ongaku Method) and you get a 1200Volt, 200mA for GM70 or 211. This tube has excellent value for the money. Low forward voltage! Mint items. 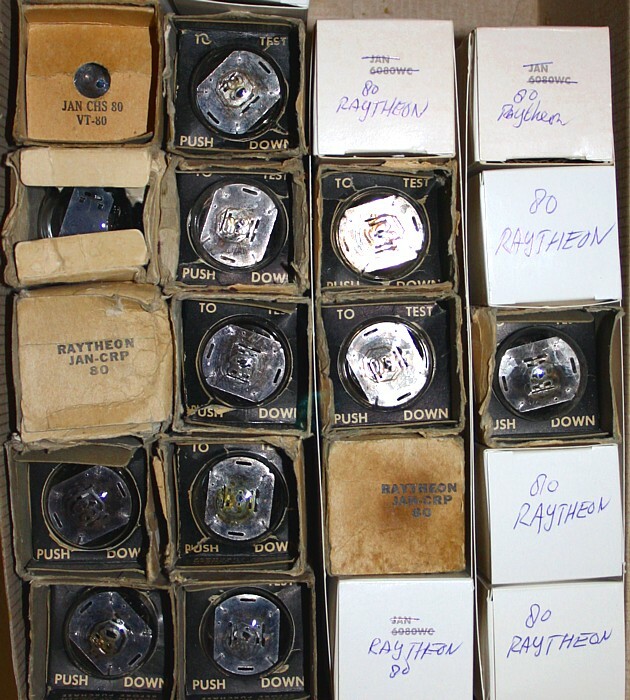 Most have the original box. Electrically tested. Socket and Top cap checked for tight connection. Very powerful mono diode. Can be used up to maximum 1400 Volt DC output voltage, 250mA. Peak 800mA. We sell also a Gold plated top cap for appr. 1 Euro. Check price list for Order number: 399-116-72. Ceramic socket, or Teflon Socket available too. This tube can deliver 250mA from a 2,5V 4,5A heater. Consider this: You can take two of those, put the heaters in series, and the plates in parallel. This would result in four pins again, and the new heater is now 5V, 4.5 Ampere. The result of this construction is, a maximum 500mA rectifier, and you can heat it with a simple 5V. Moreover, this heaster is now 2.5-0-2.5V and you can even the "0" as a center as tap, but you do not have need to. Here is a schematic showing how to put 2.5V rectifiers in series, it is for another tube type, but for RG105 it would work identical. With this schematic there is also a center tap used. Hoges = Hochohm gesellschaft, Germany. Tests very nice, with 40mA on Funke W19. "Good" starts at 28mA. SIngle mesh diode. These are English RGN2504, with fades stamp. It can be seen they are English, I think probably Mullard. 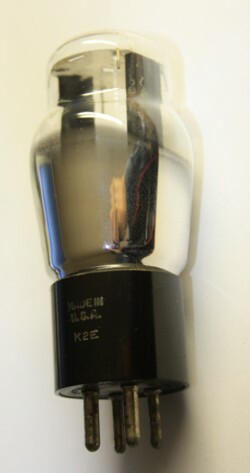 Identical appearance like Mullard GZ34, but RGN2504 is directly heated. Heater is 4V, 2.5 Ampere. Mint appearance. Please ask for pictures. Beautiful looking MESH single diode. Pristine Quality mesh tube. Original box, with some factory papers inside. Same production code number on the box and on the tube. Extremely hard to get with such optical appearance. One of a thousand is like this. Identical tubes like above. Measure and look like 100% new. Packed in a standard Telefunken box from the 1950's. So there is not this blue band as on the box pictured above. 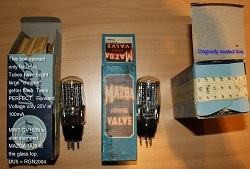 These are stamped Siemens or Philips AZ50, but they are Mullard RGN2504 re-branded as Philips AZ50. 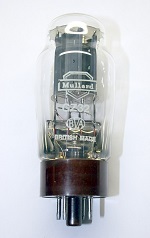 They have the Mullard typical design inside, and on some tube is written "Made in England" . Some have the Mullard typical small printing on the back. It can not be seen well from the pictures here, but the plates are from solid copper. This is also typical Mullard. From the plate edges it can be seen clearly with some of the tubes, but not with all. Second the are not AZ50 because this tube has 3 Amps heater current. 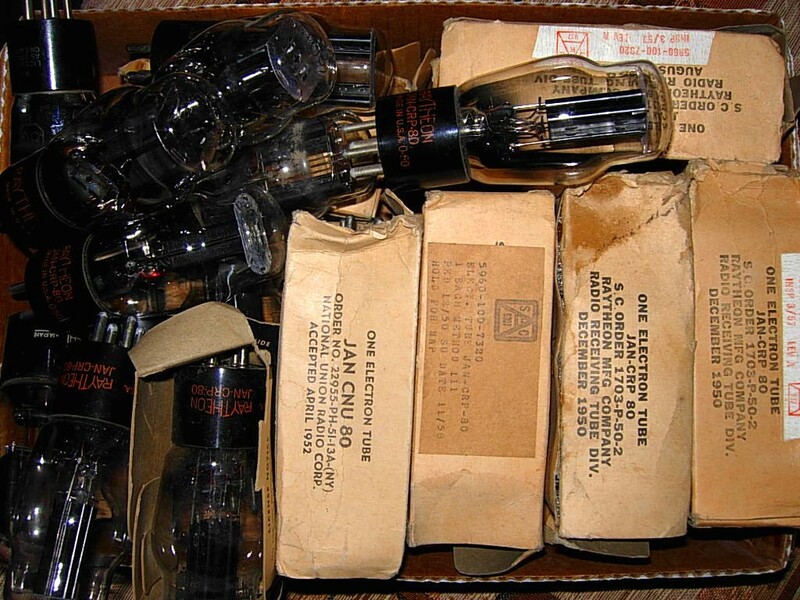 However for those tubes here, I measure exactly 2,5 Amps with each of them. So these are definitely RGN2504, and not AZ50. Bases are very clean and very tight. Printing is reasonable with all tubes, but not better as the one here pictured. Print color is bright white with all of them. Here is your change to buy NOS RGN2504 by Mullard! 2x branded MWT1039, and on the glass top also MAZDA UU5. UU5 is electrically equivalent to RGN2004. Beautiful glow picture because of many small holes in the anode. READ THIS WHEN YOU ARE A TECHNICAL FREAK! UU7S IS A GENIUS TUBE! 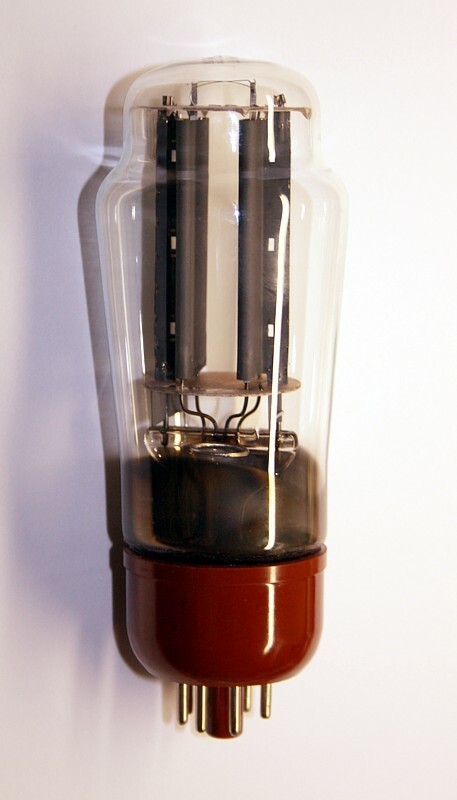 UU7 is a British tube, with OCTAL base and 4Volts heater. It has also an octal base, and is UPWARDS compatible to UU7. So UU7S comes close to 5U4G. Now how to prevent you put a 4V tube in a 5V amplifier and vice versa? They did so by wiring the UU7 at the empty pins of 5U4G. So when you have a 5V amplifier, nothing happens when plug in a UU7, and the same is for a 4V amplifier and you plug in a 5U4G. Very well done! Here is a nice idea: You can wire the socket such that BOTH tubes will work, just plug it in, and the socket will switch automatically from 4V to 5V. Note, 5U4G can do maximum 250mA. UU7S can do maximum 200mA. Wheras UU7S can do 60uF vs only 33uF for 5U4G. So when you choose 33uF, 200mA max, you can swap just from one to the other. Connect 5V to pin 2 and 8. Connect one resistor of 0.22Ohms, 1 Watt between Pin 2 and Pin 7. Done! Now you can plug in UU7S or 5U4G as you like. Note the maximum values in the next table.